Yesterday, I wrote about Judges 11 where Jephthah made a vow to God, which ended up with Jephthah “sacrificing” his only child (a daughter) to God. Today I want to expand on a few things. First, I think it’s really, really important to remember that in this situation God did not ask Jephthah to sacrifice his daughter. In fact, God’s voice in this section is completely silent. Nowhere does the Bible say that God was pleased with the sacrifice. In fact, I know from other Scriptures that God was no doubt was repulsed by it. There are quite a few Scriptures that strictly forbid human sacrifice (Lev. 18:21; 20:2; Deut. 12:31; 18:10; Jer. 19:5;). The reason this prohibition was needed was the other pagan religions surrounding Israel encouraged child sacrifice in order to appease their gods. If anyone utters with his lips a rash oath to do evil or to do good, any sort of rash oath that people swear, and it is hidden from him, when he comes to know it, and he realizes his guilt in any of these; when he realizes his guilt in any of these and confesses the sin he has committed, he shall bring to the Lord as his compensation for the sin that he has committed, a female from the flock, a lamb or a goat, for a sin offering. And the priest shall make atonement for him for his sin (ESV). This law makes it completely clear that he could have repented of the sin of making a rash oath to God and there was a means to forgiveness. 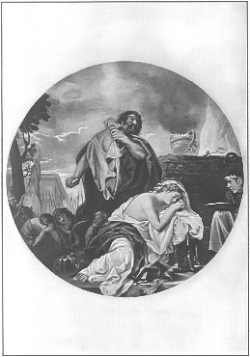 I get the impression that Jephthah was more interested in his own reputation than doing what would ultimately please the Lord. He made an oath and thought he would appear weak to others if he admitted he was wrong. Third, I think this passage shows us how terribly wrong things can go when we act out of our own selfish impulses instead of seeking God’s will. When we make rash promises to others we can let them down. When we make life decisions without dedicated times of prayer our lives can be impacted negatively, to say the least. Overall, I’m both perplexed at this passage and in awe of it at the same time. What makes me respond in awe is that it is included at all in the Bible. The Bible is a raw, uncensored look at humanity in both its purest and most raw forms. We can do terrible things to each other, and yet, somehow, God chooses to love us. Thank you, Lord, for loving a sinner like me. You’re right… there is a real comfort in the fact that such a lesson in humanity and God’s willingness to love us even when we are so far from living the life He intends for us… :). Kevin, I missed part 1 so just read both parts today. This particular passage has always messed with my head, too. You have some really great insights here and I think you should pull it together into an article and have it published. Maybe Christianity Today or World Magazine. With a reprint in The Christian Standard or Lookout (do those still exist?). Thanks for the suggestions. I’ll see about doing that sometime. I totally agree with everyone’s wise insights. Esp with your last couple of lines, Kevin — the Bible’s historical narrative is an uncensored look at humanity’s good, bad, and ugly. Recording an event doesn’t endorse it. I just wonder what (who?) Jephthah thought would walk thru his front door. One thing I’ve read is that a possible interpretation of his vow is “whatever comes through the door” which would indicate that he thought it might have been an animal. Even so, he fully intended to “sacrifice” whatever came out, human, animal, or otherwise.